When you hear the phrase &apos;clock springs&apos;, your mind will undoubtedly jump to the small components within mechanical clocks. However, this assumption would actually be mistaken, as these clock springs are not specifically used in clocks, but are instead very varied in purpose. Clock springs are sometimes known as &apos;power springs&apos;, and are made by winding a strip of material on an axle within a circular &apos;keeper&apos; case. The material in question is usually steel, as it possesses a robust resistance to fatigue, although other spring-tempered materials can also be readily used whenever required. 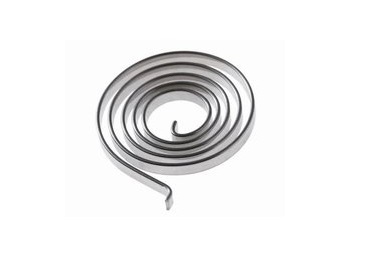 The manufacturing process of a clock spring results in it having a fairly distinctive &apos;spiral&apos; shape, although this coil is not vertical in the manner of many other springs. Clock springs take their name from their visual association to the actual springs that are used in clocks. Clock springs are ideal candidates for use when multiple turns would otherwise be required from a torsion spring, and because of this they utilise similarly &apos;flat&apos; wires rather than traditional round ones. A clock spring revolves around a defined axis, and the outer edge of the spring transfers force onto another object as it pushes against it. They specialise in providing torsion, and are also very efficient when it comes to reducing the friction that such an action might normally create, largely due to their open style coils. A wide range of industries use clock springs, including the automotive, mechanical, medical and electrical sectors. One of their most famous utilities is when they are being used in the steering wheel of a vehicle. A clock spring allows the wheel to turn while maintaining connectivity with other systems, like the airbag and horn, and this use alone is vital enough to cement their importance beyond any reasonable doubt. Whether you are looking for clock springs in particular, or indeed any other type of spring, European Springs are the ideal place to come to see your needs met. Although we are based in England, we also serve as spring manufacturers in Ireland and other locations across the UK, and even operate on an international basis too, so we can be of help wherever you might be. Call us on +44 (0) 208 663 1800 to find out more.